Oil  rose on worries about escalating tensions  in the Middle East. The U.S. dollar  index traded and treasuries fell on poor economic data that increased the possibility of more stimulus measures from the fed and sent the Dow, Nasdaq, and S&P higher. Among the big names making news in the market  today were Verizon, UnitedHealth, Citigroup, Philip Morris, Travelers, Walgreen, Morgan Stanley, Deutsche Bank, and HSBC. 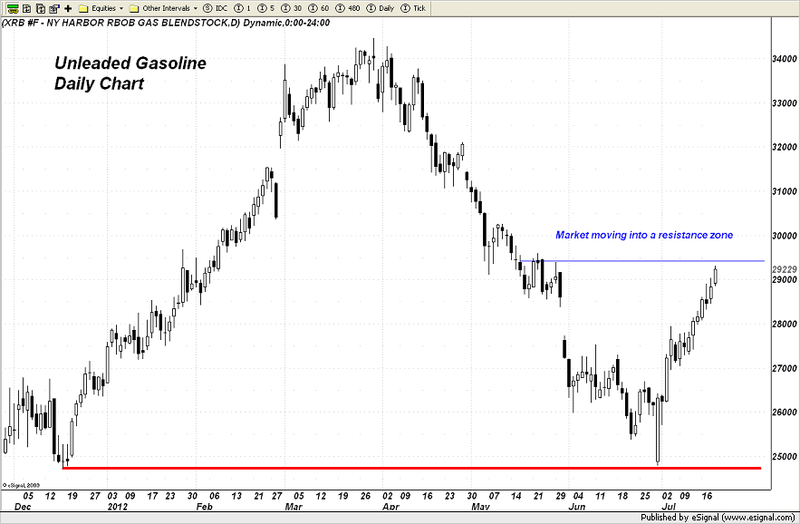 “Yesterday I posted a chart and a very brief comments noting the rise in gasoline  prices at the Nymex. Today we are seeing additional gains in this crucial market with the price currently up 1.5% as crude oil soars back through the $90/bbl level.